This is part two of, “How to Get Your Students Speaking the Target Language Outside of Class”. Or, how to find conversation partners for your students. In case you missed it, click HERE to read part one. 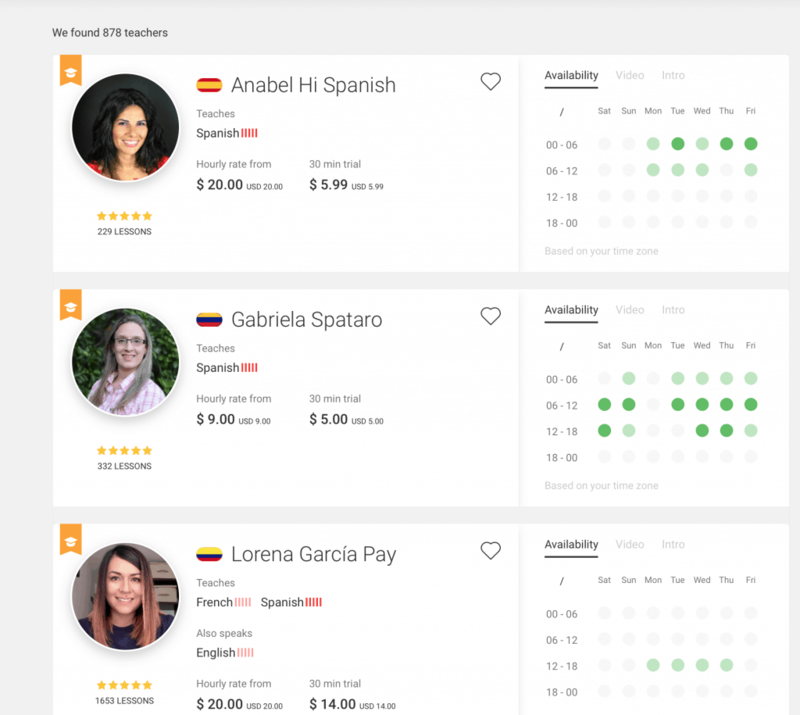 With a ratio of 36 students per teacher, how are the students going to get the one-on-one communication they need in order to become proficient in the target language? They’re not. But new technology and services make it very easy for them to find conversation partners. What’s the best way to find conversation partners for your students: take them to another country to study and live for six months to a year. JUST KIDDING! 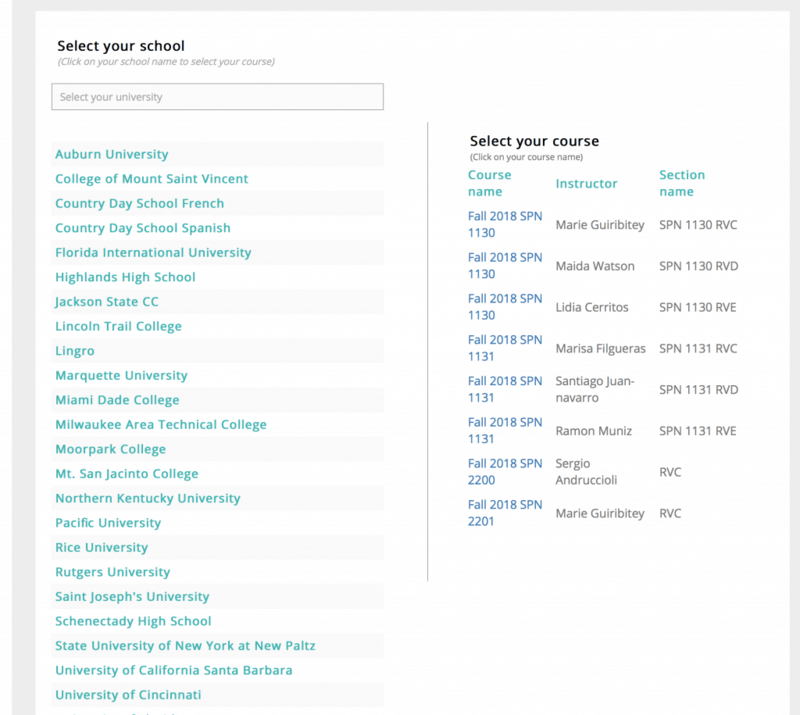 First the teacher registers by choosing his/her school and then his/her course. 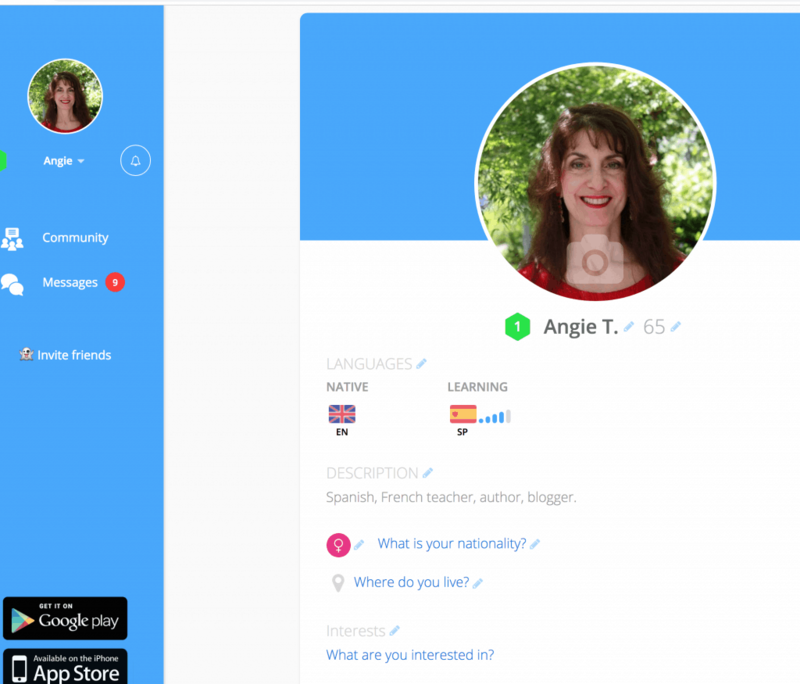 Once the teacher registers, students find a native speaker tutor or conversation partner. They sign up to speak to them by choosing an available 30-minute time slot on the calendar. Students may speak in a group or one-on-one. Individual sessions are recommended for upper-level courses. Prices are very reasonable, as low as $10 for 30 minutes of one-on-one or $5 for a group. Using Zoom (a video conferencing tool similar to Skype), they speak to their conversation partners. One Spanish speaker talks with one student or a group of three to five students. The coaches review the homework assignments and integrate the topics students are learning into the discussion. RECOMMENDED FOR UPPER-LEVEL! Group conversations are not as beneficial because students need one-on-one conversation. Therefore, I recommend this service for upper-level students. Students can only access the native speaker if facilitated by the teacher. That can be a negative or a positive. I see it as a positive because this site has a HUGE advantage over some of the other services: built-in safety feature. Teachers have the capability of observing and monitoring the conversations. Of course, most teachers would not have the time to watch most videos but students don’t know that. 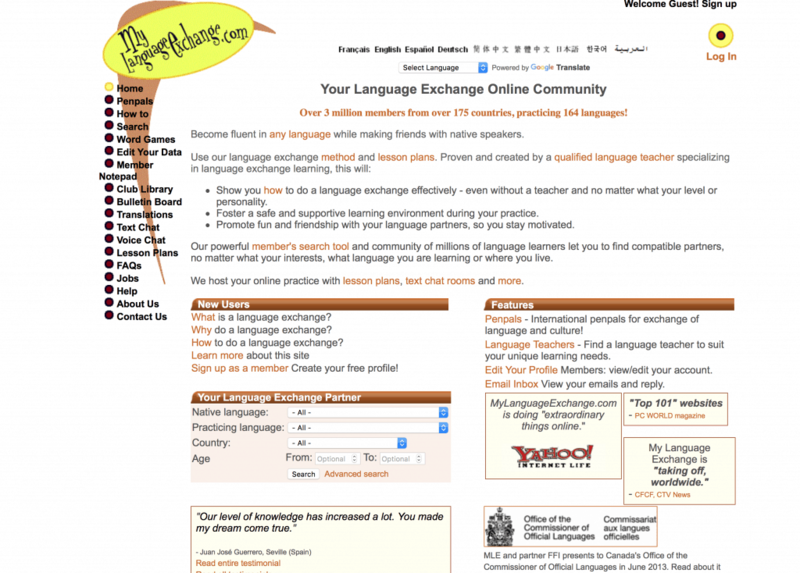 I filled out my profile, then clicked on community, then “Language Partners” then, “Find a Teacher”. What!? I have to pay? I’m outta here. C’est une blague. Actually, some of the prices are extremely reasonable. I’m thinking I might want to hire one of them to keep up my fluency. I scheduled a session with Sergio for 60 minutes and paid $10.69. I enjoyed my conversation with him and recommend him as he is fluent in Spanish and English. The fees vary from $6 to $20. I calculated $10 for each student in our department to speak once (a minimum of five times would be ideal). It came to over $4,000. So, while I love this site, it may be more feasible for college students who would pay for their own sessions. However, an advantage for high school students is the built-in safety. It’s highly improbably that students will connect with the native speakers because of the geographical distance. Also, if anyone complains of harassment, the speakers lose their jobs. Here is a snippet of a conversation I had with Sergio in Italki. 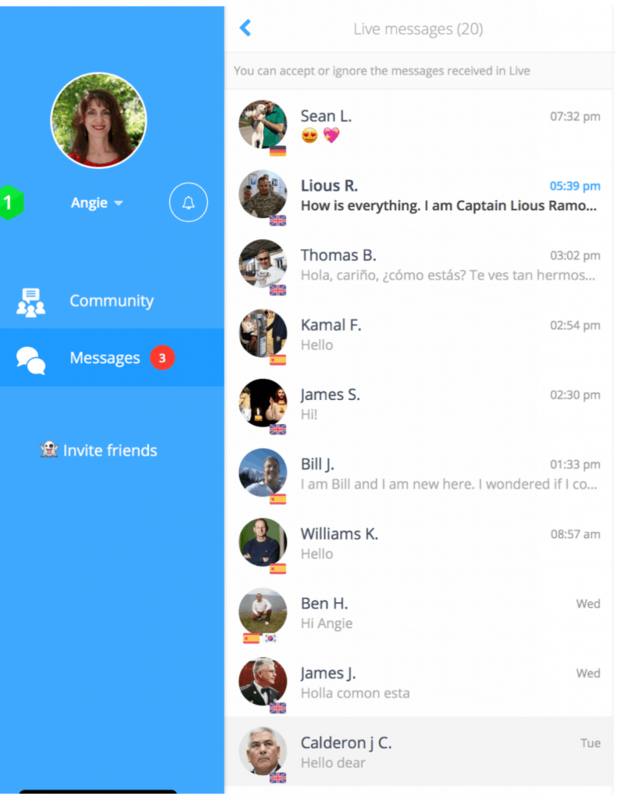 This desktop site is mostly for chatting or texting. Below I detail my experience. First, I set up my profile. Alert! Alert! As soon as I signed up, conversation requests (all from men) started popping up like bubbles. Immediate opportunity! 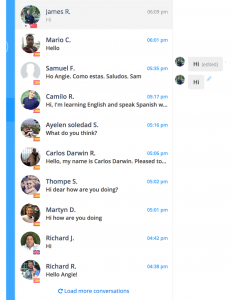 Instant chatting with a myriad of people!!! Most of whom want to date me??? Agh! It’s really cool how speakers can correct each other’s errors by clicking on the pencil icon. Students can easily see what they wrote incorrectly. They can also add emojis. You can record messages also if you click on the microphone to speak, although that did not work for me. Apparently, you either have to pay or fulfill certain tasks before you are allowed to speak. Every time I tried, I got the eternal rolling circle. It may have been a technical issue. Here are some tasks you need to complete on order to advance. 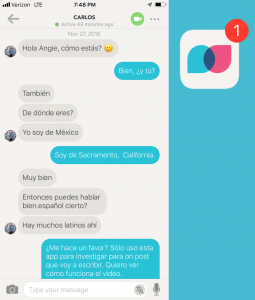 It’s a great way for students to connect, especially if they want a quick way to text. As you can see in the video below, my partner was able to record a message to me. 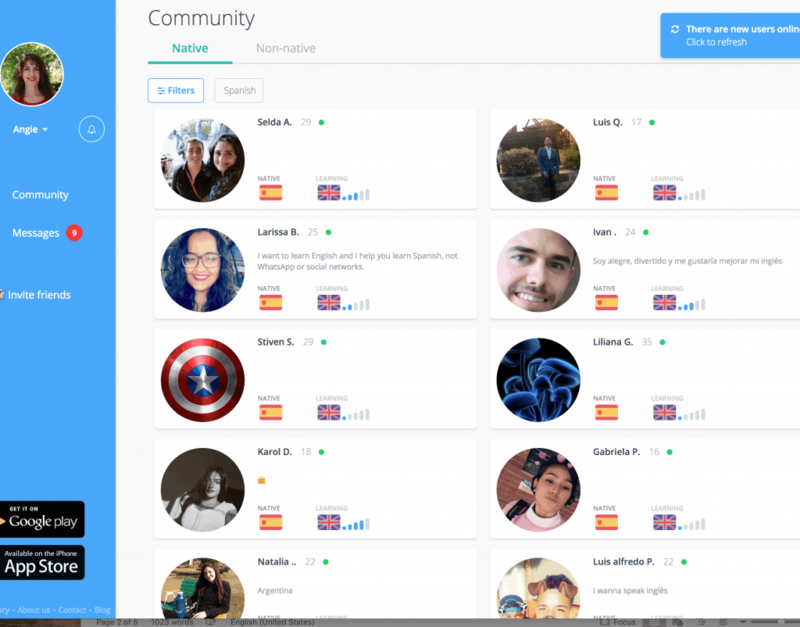 CON: The native speakers sign up to practice English, so students would not be able to communicate authentically in the target language. They would have to take turns and, thus, not get the comprehensible input they need. A solution would be to tell them to communicate one time all in the TL and the next time all in English. Beautiful, clean website. Good first impression. 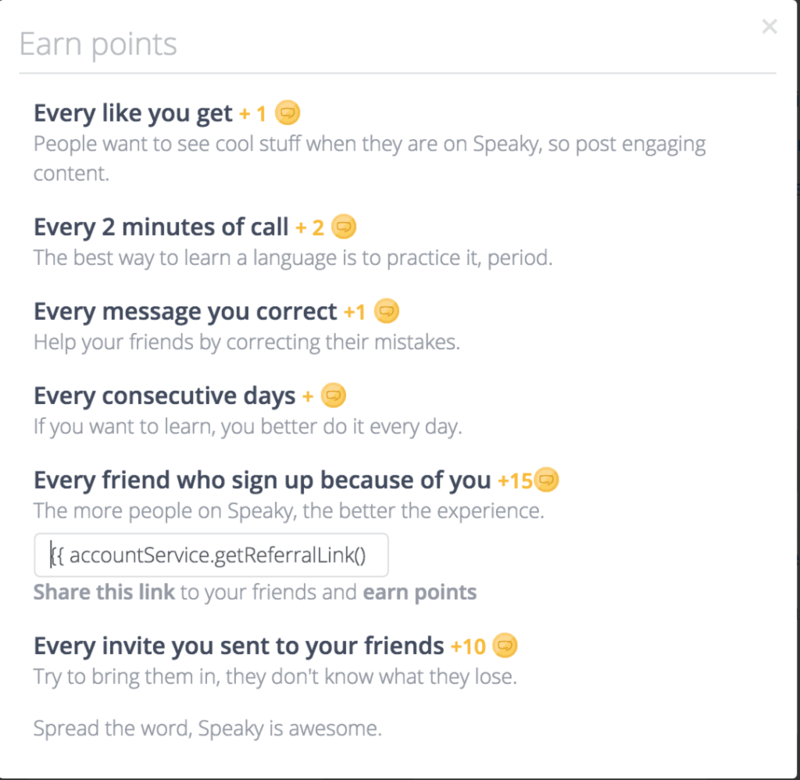 I signed up for free but then was sent to a beginner’s lesson on how to say, “hello” and, “thank you”. What!??? Then, I received an email from someone who wanted to exchange emails. So, I wrote back. Still wondering how to chat or video chat. In order to see the last message I wrote, or my partner’s new message, I had to refresh the page each time. The only way I knew it was time to refresh was to wait for an email from CE. So, I had to keep checking my email. NOT CONVENIENT! My partner wanted to continue in WhatsApp because she thought it would be easier. 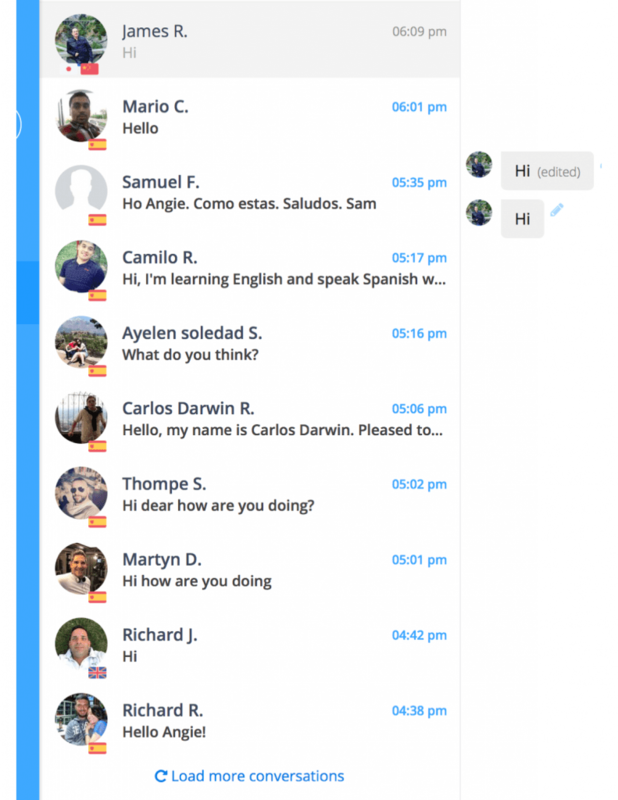 So, I guess you meet the native speaker in Conversation Exchange and then continue the dialogue in a more fluid / convenient app. It felt like writing emails and waiting for a response, definitely too staccato for comprehensible input. Once you connect with someone and want to speak (OMG Dating Site PTSD!) you both agree to talk via Skype. My partner didn’t want to video chat because it was late, and she didn’t want to awaken anyone. So, we used Skype to chat. Once again, there is the danger of students speaking/writing English to English learners and not communicating in the target language at all. Therefore, I would require students to record their conversations or share screen shots of their texting. Distracting, hard to navigate website. Free unless you want to actually initiate a conversation. So, NOT FREE. $6 for one month in order to initiate communication for Pen pals, Text Chat, or Voice chat. You first exchange written conversations with the person and then agree to video chat using the program you both have. In theory. I couldn’t get the chat to work because it said I had to disable my pop-up blockers. Didn’t want to do that. (And couldn’t figure out how.) Clicked on, “Voice Chat” and found out they have discontinued that service and you must use Skype or another program. MY OVERALL IMPRESSION: NOT RECOMMENDED. Not user-friendly. Easy to access because it’s right on your phone and it’s free! Fun but a bit slow, not spontaneous. One benefit for reticent or anxious students is that you can replay the recorded message until you are satisfied with it before sending it. In order to record, press the microphone, hold it down and talk, then release to send. To hear the partner’s message, click on the arrow. Students can replay the speaker’s audio message by clicking again on the arrow. Good for audio practice. LOVE Tandem! Good, clear audio. As with the other apps, you must text before you can record your voice or videotape yourself. You can listen to yourself and retry before sending your message. There is a translate feature if you don’t know how to say something. 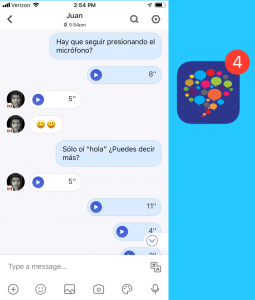 This is a good app for self-conscious students who want to make sure they are saying things correctly before sending. They can listen, redo, then send. My partner contacted me about an hour after I selected her, pretty fast! It’s an app for your phone so it’s very convenient! The only downside is you have to wait until someone is available but that happens frequently enough and is super fun when it does. I think this app will skyrocket student interest and motivation because they are talking to real people. You can even take pictures and send them and use video, so you can see the other person!! 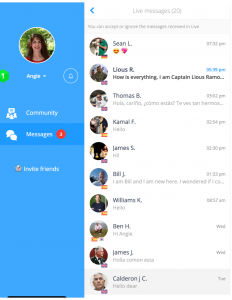 It works like Skype or FaceTime only much easier and right on your phone! Again, the teacher must build in protection for the students, such as immediate and ongoing adult supervision. OVERALL IMPRESSION: EXCELLENT! This is the one I would use. 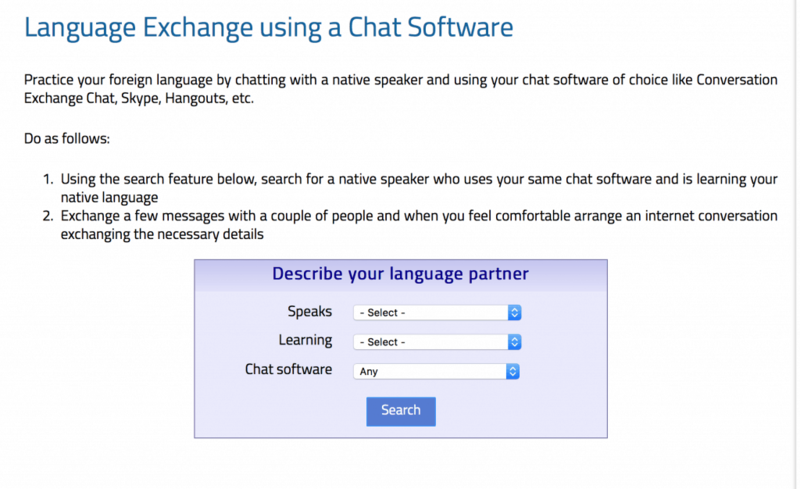 Now, with three recommend tools you can easily find conversation partners for yours students. Students watch a video with subtitles in Spanish and English below it. Wow! These videos are awesome, and they have all levels! Oh no! Competition for MY videos! (You can buy mine for $3-6 and then you will always have them- no subscription necessary.) Click HERE to see my videos. That said, if your department can afford it, Yabla is worth the money because it provides great comprehensible input and is differentiated. You can click on a word to find out what it means, slow it down, back it up to watch it again. Amazing! The more student subscriptions you have, the lower the price per subscription. Here is a short clip on a Yabla video on colors and the expression, “me gusta”. See what I do with it and how I slow it down. Every month I blog about teaching tips and give away freebies. 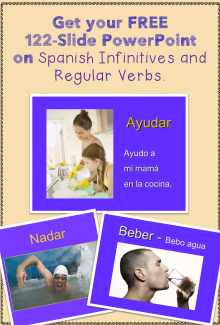 If you’d like to see these in your email, subscribe to my newsletter here: Best PowerPoints for Spanish and French and get a free 122-slide PowerPoint on Spanish Verbs. Scroll down to the bottom to subscribe. Are you following my store? Be the first to find out about site-wide sales, new and updated products. Click HERE to follow my store.